What is happening with our Communion cup? Someone asked today, What did we drink? I also wonder. I have talked to at least 5 people at DHBC (not counting you) about Communion, and they all know that Jesus used wine, and think we ought to do the same. NONE can explain why we don’t. You haven’t either. As one person said, Why don’t we use the good stuff like the Roman Catholics? My question is, Why are the Roman Catholics more Biblical on the cup than we? Why is our cup a mystery drink? What is your objection to being Biblical? One person thought alcoholism might be the reason. My response is, why should an alcoholic compel Christ’s Church to be unbiblical? Is alcoholism a sin more powerful than the grace of Christ? 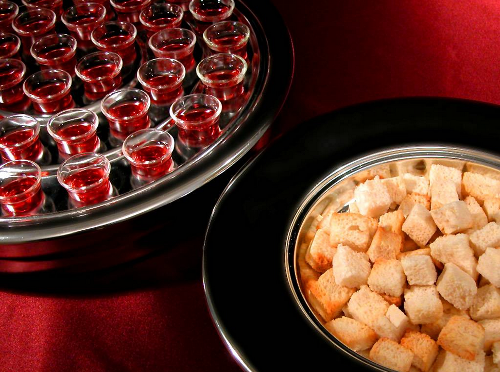 Some churches put both (unmistakable) grape juice and wine in the tray, one on the inside, the other on the outer. Jesus did not do this. But at least that allows some believers to worship Biblically. At DHBC none of us can. Please apply God’s Word to this continuing problem. WoW! Interesting points. But let’s first look at the history of this debate. For 1,869 years, the church used only wine. The concept of using grape juice was born out of the temperance movement in the United States in the 1800’s. It wasn’t until the year 1869, that Thomas Welch (yes that guy) who was adamantly opposed to the buying, selling, or use of intoxicating beverages. He discovered that Louis Pasteur’s method of pasteurization (it wasn’t until the 1880’s that pasteurization came into practice) prevented the natural fermentation of grapes. Welch peddled his idea to churches in the area, who were quick to adopt this means of celebrating the Lord’s Supper. We know from history, and the Bible itself, that Jesus did NOT turn the water into grape juice! (See John 2 for details). The biblical and historical precedence of using wine for communion was established at the Last Supper (Matthew 26:17-30). Biblically, we can’t make an argument for grape juice. It’s conversion into wine is a natural by-product of squeezing grapes. Mark 2:22 and Matthew 9:17 reminds us that no one puts new (unfermented) wine into old wineskins. The process of fermentation produces carbon dioxide gas, which causes expansion, and bursting. You really could not stop the conversion of grapes into wine. Until 1869. Which historically, is recent. The controversy then becomes one of conscience. Shakespeare reminds us in Hamlet: “…thus conscience doth make cowards of us all.” How perfectly candid, did Shakespeare understood the human condition. So do we upset the order of things (traditions of man) to bring us back in harmony with the Word of God? Yes…but. And this is my opinion. The Bible is replete with scriptures on causing others to stumble. Strong warning from Scripture. Do we serve wine, which is the Biblical order, or do we serve grape juice because of someone’s conscience? Ay there’s the rub. Two diametrically opposed thoughts. The quandary is completed. I offer this solution. For those of us who are able, wine. For those because of conscience sake, grape juice. Yes I know that grape juice is a MAP. (Methodist Approved Product). Would this cause further dissension? I am one guy. What say you?